We’re celebrating the National Cherry Blossom Festival with our own Cherry Picks — posts and recipes featuring cherries each day this week. Learn more about the National Cherry Blossom Festival here. Insulated cookie sheets are actually two sheets with air trapped between them. They heat evenly and keep cookies from over-browning, but don’t allow them to crisp well. Get rid of sheets that are warped or bent. They’ll prevent cookies from baking evenly. Dried cherries are the perfect complement to the semisweet chocolate chips. These cookies have a wonderful crunch. Take them off the baking sheet immediately after removing them from the oven for a softer version. Use dark chocolate chips for a richer, more chocolatey cookie. Whisk dry ingredients (flour, baking soda and salt) together to ensure they’re well-mixed before adding to the batter. 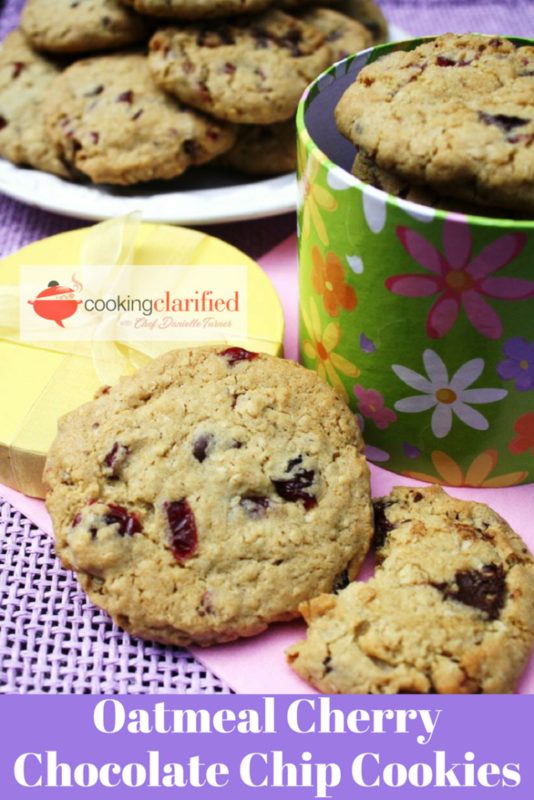 Dried cherries are the perfect complement to semisweet chocolate chips in these tasty cookies with a wonderful crunch. Preheat oven to 350 degrees Fahrenheit. Line 2 baking sheets with parchment paper. Combine the flour, baking soda and salt in a medium bowl. Cream the butter and sugar together in the bowl of a mixer until light and fluffy. Add the egg and vanilla. Stir in the oats, cherries and chocolate chips. Drop the batter by rounded teaspoonfuls onto prepared baking sheet. Bake cookies 13-15 minutes or until golden brown.